You can resolve action items and leave a note explaining why you are resolving it. The author of the top-level item and owners of an action item have permission to resolve action items. 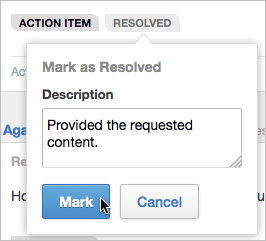 For comments or replies, click the Action Item badge and select Resolve. Add a note explaining why you are resolving the Action and click Mark. This note is visible to others, so it's helpful to describe how you resolved the action. The Resolved badge appears on the content item.